It can be confusing deciding on the best flea treatment for your cat as there are many choices. Some treatments, like flea spray, flea powder and flea shampoo will give instant results although not long lasting. For a longer lasting result the best options are flea drops and flea collars. Something else to consider is whether you prefer treatments that use chemicals or products that have natural options. Diatomaceous Earth - What Is That? Natural treatments are defined for this article as treatments that don’t contain chemicals, apart from naturally occurring chemicals. Do natural treatments work as well as those made using chemicals? It is recognized that using natural or chemical free treatments is going to require more of your time. ​If this is an issue for you then this is an important consideration. Often natural products need to be reapplied frequently, they may take longer to apply and you do need to be vigilant about checking for the return of the fleas and then reapplying the treatment. Click here to read detailed information about natural options and different types of treatments, and how to choose a treatment. Flea drops are applied topically (onto the skin), between the shoulder blades. The applicator usually has a snap top. Snap the top, part the cat's fur and squeeze the drops onto the skin. That's it! 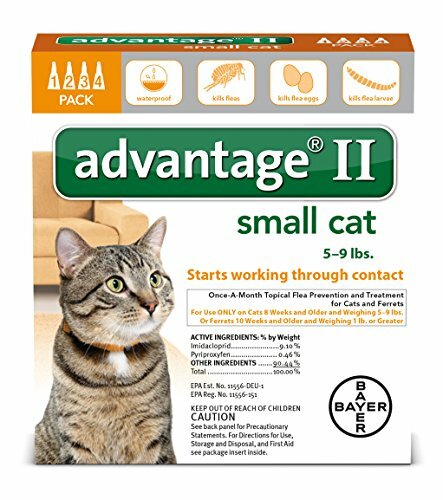 They are without a doubt the gold standard of flea treatment for cats. ​The reason flea drops are ​so popular​ is because of ​the effectiveness of the treatment, closely followed by ease of applying and only having to apply once per month. For that entire month and often longer, there is excellent flea protection. Occasionally an animal will have an allergic reaction, so it's always wise to keep a close eye on your cat for 24 hours after applying. ​A flea collar is undoubtedly one of the most popular flea treatments and for good reason. It does the job it is supposed to do and that is keep the fleas away. It may seem costly ​however with the Bayer Seresto collar it is 8 months protection you are paying for so, it actually makes it cost effective as well as convenient and reliable. This product does double duty as it also controls ticks. There's more detailed information specifically about flea collars here. Cat Flea Drops and Cat Flea Collars as described above, are without doubt the most popular cat flea treatments. For the most part they are excellent, however there are natural treatments described in detail here. If your cat has an allergic reaction to the drops or collar or if you prefer to use natural products, there are other options. ​Using a cat flea shampoo followed by combing with a flea comb will give a good instant result. If the thought of giving your cat a bath is scary, there’s only one way to find out how it will go and that is to give it a go. Wear long sleeves ​for protection and also fill the bath beforehand so that the running water does not scare the cat. There is more information here about how to give a cat a bath and use cat flea shampoo. Some find the smell of certain cat flea shampoos overpowering ​ and there is more information about that in the link above. It's a personal choice. I don't think anyone has actually asked the cat. This is not to make kitty smell nice although it will have that effect but it is a powder to get rid of fleas. Flea powder for cats is a quick and convenient choice. It works quickly so brings fast relief. It is a useful product to have on hand for when fleas appear and they will at some point. Just bear in mind that you will need to keep reapplying this product. There is more information here about using flea powder and how to apply it so that it is effective for flea control. Diatomaceous Earth has many uses and one of them is the control of fleas for cats and dogs. Click here for detailed information about diatomaceous earth and how to use it in the home for flea control in cats. Cat flea spray can mean either a spray that you spray onto the cat or a spray that you use in the home and yard. Often the two are used in conjunction with one another. When using a spray it’s a good idea to first of all spray onto a piece of cloth and rub onto the cat’s fur rather than spraying directly onto the cat. Also treat other flea affected areas such as the cat’s bedding, scratching post etc. Our kitty has many favorite sleeping places, the comfy places of course, so remember to treat all the areas ​your cat likes to sleep or lounge about while secretly checking out the neighborhood. Click here for in depth information about how to use cat flea spray and questions regarding using cat flea spray. A cat flea comb is usually used in conjunction with other products, for example after a shampoo or after a spray or powder dusting. Even with the most diligent attention paid to getting rid of fleas they can appear out of nowhere. Even if not an infestation we really don't like to see our kitties scratching ​. A flea comb is inexpensive and useful to have for anyone who owns a cat. Our cat has entered his senior years and is now almost 18. He has always had the topical treatments (flea drops) and we have had no flea problem ever, apart from when we have forgotten to apply the next dose. ​Have kids? Get the kids to decorate the calendar ahead of time for flea application day.